By LUDWIG VON KOOPA - Filler before the tournaments. 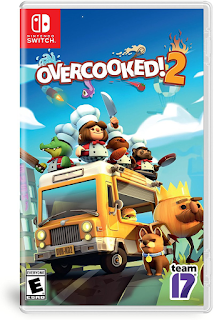 Do you want to watch some intense Overcooked! 2 action? Sorry, we did a terrible job live reacting to it. Sorry. We didn't do a great job with the Super Smash Bros. Ultimate action after. It's really filler, even from Nintendo Treehouse. Ludwig and Rawk are lackadaisically paying attention. You should also check out the E3 2018 Schedule. [3:14 PM] Ludwig Von Koopa: We're BACK. [3:14 PM] Ludwig Von Koopa: Already. [3:14 PM] Ludwig Von Koopa: Very quick transition. 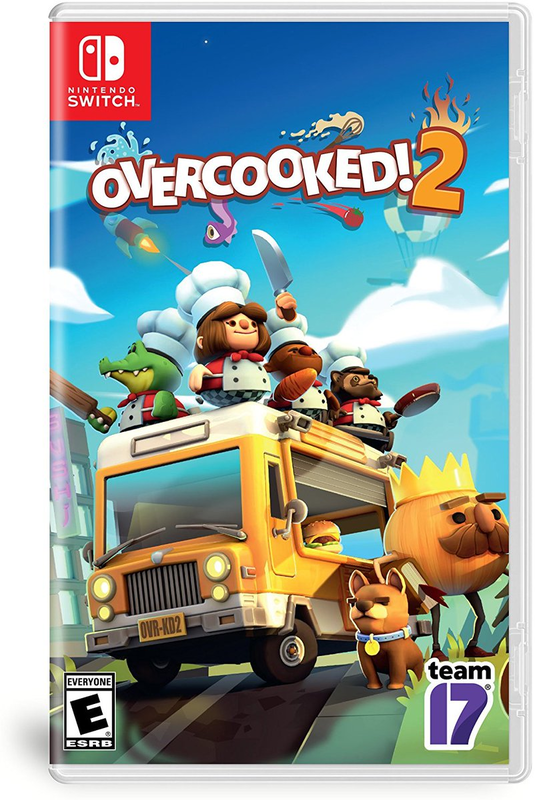 [3:14 PM] Ludwig Von Koopa: Ollie and Phil, developers from Ghost Town Games for Overcooked 2. [3:15 PM] Ludwig Von Koopa: Cooperative cooking game with different cosmetic cooks. [3:16 PM] Ludwig Von Koopa: Unprofessional voice acting. I like it. [3:19 PM] RawkHawk2010: I like the boxart. Boxart. Yeah. 'cause we didn't take pictures. [3:20 PM] Ludwig Von Koopa: Should I pay more attention to this? [3:20 PM] Ludwig Von Koopa: Splatoon tournament in 40 minutes. [3:20 PM] Ludwig Von Koopa: This looks like a Mari0 Party minigame. [3:21 PM] Ludwig Von Koopa: In terms of movement speed/lag times, or match times? [3:22 PM] RawkHawk2010: Or whatever would make it a "Melee killer"
[3:22 PM] Ludwig Von Koopa: Maybe Jigglypuff will have good movement speed in the air this time and be usable. [3:24 PM] Ludwig Von Koopa: Neither do I! [3:24 PM] Ludwig Von Koopa: They're making sushi. [3:24 PM] Ludwig Von Koopa: Maybe they'll plug Sushi Striker. [3:25 PM] Ludwig Von Koopa: Overcooked! 2 has online multiplayer. [3:27 PM] RawkHawk2010: Someone narrating this sounds like a more elated Malos. [3:27 PM] RawkHawk2010: It's weird. [3:29 PM] Ludwig Von Koopa: "Hey, wanna play Ultimate?" [3:29 PM] Ludwig Von Koopa: "Let's Ultimate." [3:29 PM] Ludwig Von Koopa: Are any other things called Ultimate? [3:30 PM] Ludwig Von Koopa: I don't want to hear anything from CAPCOM unless it's Ace Attorney. [3:30 PM] Ludwig Von Koopa: Even if I like Mega Man 11. [3:30 PM] Ludwig Von Koopa: They're gonna show something on Treehouse Live in-between this and the Splatoon tournament. [3:31 PM] RawkHawk2010: Added that to the Direct log. [3:35 PM] Ludwig Von Koopa: More Smash Bros. Ultimate? [3:36 PM] Ludwig Von Koopa: Are they doing Smash after every other game? [3:40 PM] Ludwig Von Koopa: They have a pic of Bowser reigning supreme over Mari0 in this transition. [3:41 PM] Ludwig Von Koopa: Oh, yikes, they have eight-player Smash, probably. [3:41 PM] Ludwig Von Koopa: But they have nine players. [3:41 PM] Ludwig Von Koopa: Morgan is playing Pac-Man. [3:41 PM] Ludwig Von Koopa: It's 4 people instead. [3:41 PM] Ludwig Von Koopa: Treehouse rules are 5-stock. [3:42 PM] RawkHawk2010: Is Galaxy Star thing the new Bumper? [3:42 PM] Ludwig Von Koopa: And using some weird move. [3:43 PM] Ludwig Von Koopa: Marth's tipper attacks all do the powerful-attack slowdown. [3:43 PM] Ludwig Von Koopa: So he's terrifying. [3:43 PM] RawkHawk2010: I think his NSider icon was even Ridley. [3:43 PM] Ludwig Von Koopa: I don't even remember who this is. [3:44 PM] RawkHawk2010: SMITBG was "Super Metroid Is The Best Game" and everyone called him Smitty for short. [3:44 PM] Ludwig Von Koopa: The Pac-Man ghosts make the entire stage background blue. [3:44 PM] Ludwig Von Koopa: Scizor is a Poké Ball. [3:44 PM] Ludwig Von Koopa: But they called him Scyther. [3:44 PM] RawkHawk2010: btw I wonder if Codecs will be back. [3:44 PM] Ludwig Von Koopa: Probably. [3:45 PM] Ludwig Von Koopa: Ridley looks like an Assist Trophy more than a character. [3:45 PM] RawkHawk2010: I wanna turn off that box. [3:45 PM] RawkHawk2010: I dunno the point. [3:46 PM] Ludwig Von Koopa: "Keep your eyes open!" - Marth, as he gets mauled by a Dragoon. [3:46 PM] RawkHawk2010: Seriously what is the point of that box when someone is about to be knocked off? [3:46 PM] Ludwig Von Koopa: I don't know yet. [3:46 PM] Ludwig Von Koopa: Sakurai will probably have a DOJO!! post on it. [3:46 PM] Ludwig Von Koopa: Or "blog"
[3:47 PM] Ludwig Von Koopa: I like that Sakurai cares about Path of Radiance and Radiant Dawn. [3:47 PM] RawkHawk2010: It's supposed to help the dying dude know how much space he has before he goes out (I think) but looking at it probably makes you more likely to die than not. [3:48 PM] Ludwig Von Koopa: I'm assuming that Fire Emblem: Three House is gonna be ick. [3:48 PM] Ludwig Von Koopa: Because I don't have faith in the series. [3:48 PM] RawkHawk2010: I just don't remember it. [3:48 PM] Ludwig Von Koopa: Me neither. [3:48 PM] RawkHawk2010: Looked like Awakening though. [3:48 PM] RawkHawk2010: With Not-Chrom. [3:49 PM] Ludwig Von Koopa: Ike missed his Final Smash. [3:49 PM] RawkHawk2010: aka Chrom but still Chrom. [3:49 PM] Ludwig Von Koopa: Even though Cloud gets them. [3:49 PM] Ludwig Von Koopa: The characters don't glow red and steamy when they're at high percents. [3:49 PM] Ludwig Von Koopa: So maybe the rage mechanic isn't in the game? [3:50 PM] Ludwig Von Koopa: Maybe the box is so you don't kill yourself if you're at the top ceiling. [3:50 PM] Ludwig Von Koopa: And you don't go jump past it. [3:51 PM] Ludwig Von Koopa: People have been talking about Sukapon since NSider. [3:51 PM] Ludwig Von Koopa: Still don't know what it is. [3:52 PM] Ludwig Von Koopa: Moray Towers is actually a crappy stage in Splatoon. [3:52 PM] Ludwig Von Koopa: And I don't think I really like it here either. [3:53 PM] RawkHawk2010: This isn't a very "happy" theme. [3:53 PM] Ludwig Von Koopa: Bewear Shoryukans people. [3:53 PM] Ludwig Von Koopa: Maybe it's how Sakurai feels about the series. [3:53 PM] RawkHawk2010: It's nowhere near as high-energy as 4's. [3:53 PM] RawkHawk2010: And I don't think that's a negative. [3:54 PM] RawkHawk2010: It's kinda between 4 and Brawl's. [3:56 PM] Ludwig Von Koopa: Quick break. [3:56 PM] Ludwig Von Koopa: Splatoon next. [3:56 PM] RawkHawk2010: Treehouse Live has too many people on screen. [3:56 PM] Ludwig Von Koopa: The tournament is in another venue. [3:56 PM] Ludwig Von Koopa: Are they gonna go warp like the Sony people did? [3:57 PM] RawkHawk2010: btw during the Smash trailer remember when they said something about the Original 12? [3:57 PM] RawkHawk2010: On a select screen and then the other character portraits started moving in? [3:57 PM] Ludwig Von Koopa: Yes. [3:58 PM] RawkHawk2010: What'd that mean? [3:58 PM] Ludwig Von Koopa: So I guess when the game comes out I'll start with Jigglypuff. [3:58 PM] Ludwig Von Koopa: It means the rest of the cast is DLC, I guess. [3:58 PM] Ludwig Von Koopa: To software-as-a-service it. [3:58 PM] RawkHawk2010: I'm okay with that. [3:58 PM] Ludwig Von Koopa: They're back on Treehouse Live. [3:58 PM] RawkHawk2010: Launching with too many dudes is bad. [3:59 PM] RawkHawk2010: If everyone is DLC then it should be old dudes interspersed with new ones. [3:59 PM] RawkHawk2010: Who's gonna be selectable in the Invitational? [3:59 PM] RawkHawk2010: The same ones as here? [3:59 PM] Ludwig Von Koopa: Probably. [4:00 PM] Ludwig Von Koopa: They're starting 12 PM tomorrow. [4:00 PM] Ludwig Von Koopa: For Treehouse Live. They're starting Treehouse Live tomorrow, but KoopaTV continues tonight for some TOURNAMENTS! The log before this was Fortnite and more Super Smash Bros. 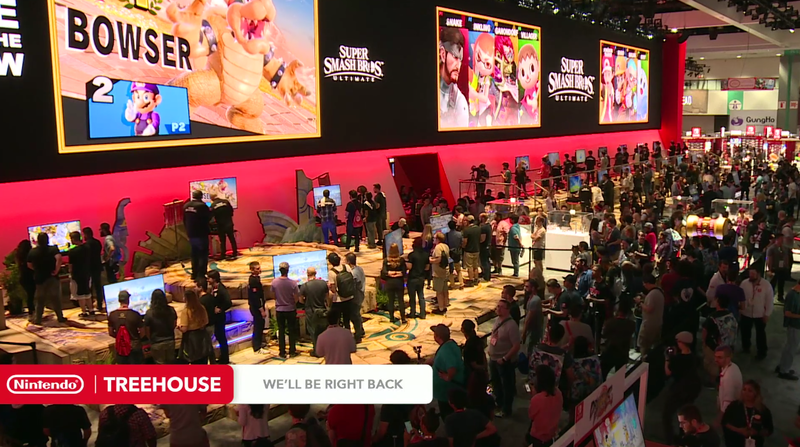 Here's what we were filling up to: Splatoon 2 WORLD CHAMPIONSHIP!